This list provides an overview of topics in music theory including rhythm, harmony, melody, scales and modes, pitch, consonance and dissonance, structure, form, and texture. Also see the "Musical Forms" section for more recommendations. The Study of the Fugue. Alfred Mann. Greenwood (hardcover) & Dover (paperback). 1984;1987. ISBN 0313226237 (hardcover), 0486254399 (paperback). Classic study comprises two parts. The first is a comprehensive historical survey of writings on the fugue from the beginning of fugal teaching (c. 1350) to the present. Part Two explores in depth four 18th century studies which are its classical presentations: Steps to Parnassus by Fux, A Treatise on Fugue, by Marpurg Fundamental and Practical Essay on Fugal Counterpoint by Padre Martini, A manual of the Fundamental Principles of Composition by Albrechtsberger. Translations of texts, introductions and critical commentary, and many musical examples. Index. Bibliography. 352 pgs. 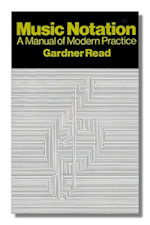 Music Notation: A Manual of Modern Practice. Gardner Read. Taplinger Publishing Company. 1979. ISBN 0800854535 (paperback). Music Notation is authoritative in every respect: written by a teacher and composer of international reputation; devoted to every phase of modern practice in the subject; concisely presented against a minimum historical background; all terms are defined upon first use. The text describes and illustrates not only the elements of notation common to all forms, but idiomatic notation for instruments and voices as well. It offers detailed guidance concerning music manuscript writing and the preparation of score and parts. Musical Structure and Design. Cedric T. Davie. ISBN 0486216292 (paperback). Clear, elementary explanation of basic forms. Renaissance to 1900. with many works analyzed. 181 pps. Structural Functions in Music. Wallace T. Berry. Dover Publications. 1987. ISBN 0486253848 (paperback). Exploration of tonality, melody, harmony, texture and rhythm, and their interrelations. Analyses of musical works ranging from early madrigals and Gregorian chants through Bach, Beethoven and Brahms to Ravel, Bartók and Berg. Index, Prefaces. 480 pgs. 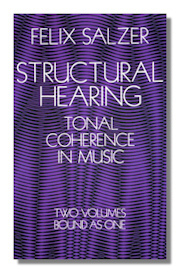 Structural Hearing: Tonal Coherence in Music. Heinrich Schenker, with Felix Salzer. Dover Publications. 1952. ISBN 0486222756 (paperback). Two volumes bound as one, reprinting the famous 1952 work. A thorough exposition in English of Schenker's theories. The text explores the phenomenon of tonal organization in Western music and analyzes over 500 pieces, connects theory and composition. 667 pgs. Five Graphic Music Analyses. Heinrich Schenker, with Felix Salzer (rev.). Dover Publications. 1969. ISBN 0486222942 (paperback). Revision of the 1932 edition. Voice leading, tonal coherence in graphic notation in five works: J.S. Bach, Chorale from St. Matthew passion, First Prelude from Well Tempered Clavier, Haydn E flat Major Sonata, Chopin Études #8 and 12, Op. 10. The Shaping Forces in Music. Ernst Toch, with Wechler, L (this edition). Dover Publications. 1977. ISBN 0486233464 (paperback). Reprint of the 1948 edition. Clear, pragmatic analysis of harmony, melody, counterpoint and form by Austrian composer known for his classical and film music. Treatise on Harmony. Jean-Philippe Rameau, with Philip Gossett (translator). Dover Publications. 1985. ISBN 0486224619 (paperback). This French composer of the late Baroque period (ranked along side J.S. Bach, Vivaldi, and Handel) was one of the most influential music theorists ever to have lived. Rameau's theory of root progression profoundly altered Western-European-derived music. Detailed explanation of principles of diatonic harmonic theory. New 1971 translation by Philip Gossett of 1722 edition. Many musical examples. Harmonic Experience. W. A. Mathieu. Inner Traditions International. 1997. ISBN 0892815604 (hardcover). 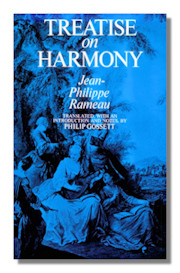 An excellent book on harmony, starting with the roots of harmony and moving to common practice tonality. ABC of Music. Imogen Holst. Oxford University Press. 1996. ISBN 0193171031 (paperback). A very gentle and precise introduction to the basics of music theory. All About Chords. Elvo D'Amante. Encore. 1980. ISBN 0962094102 (paperback). A comprehensive approach to understanding contemporary chord structures and progressions through solid drills in suggested study questions, keyboard drills, and ear-training exercises. A step by step approach to the study of triads, seventh chords, and their extensions. Additional chapters on chord progression through area studies of the pre-dominant, dominant, and tonic spheres of influence: chord derivation, substitution, interchangeability, tendency, harmonic pulse, and function. Chord qualities are also presented for study. Table of contents, examples, keyboard drills, assignments, ear-training exercises, addendum, suggested study drills, and index.